Belts are cute on kids but TOTALLY impractical! Buckles are hard, uncomfortable and hurt their little tummies! The look of the belt without all the pain and hassle! Most people can't tell it's not a real buckle until they touch it. Some never figure it out! All are pre-washed and pre-shrunk. Double washing process makes the 10 oz. denim super soft but extremely durable at the same time. Snaps in the legs for diaper changes and tons of elastic in the waist, for the chubby and the skinny ones alike! 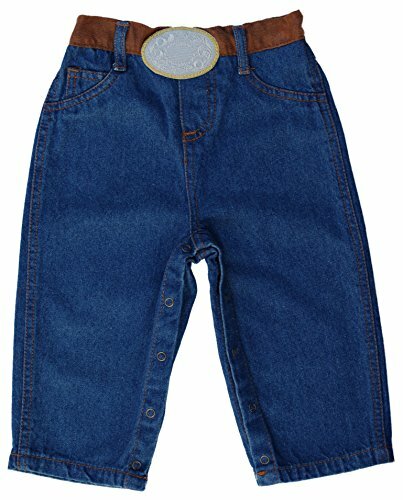 10 oz denim, pre-washed, pre-shrunk, snap legs, built in soft fabric belt and buckle. 100% Cotton. Made by 4Rodeo. Back pockets are actual pockets, front are not. SIZING INFO: (or see size chart image) 0-3 MONTHS: 0-7 lbs, 7 inch waist (stretches larger), 6 inch inseam, 12 inches from waist to ankle. 3-6 MONTHS: 6-10 lbs, 8 inch waist (stretches larger), 6 ½ inch inseam, 13 inches from waist to ankle. 6-9 MONTHS: 6-20 lbs, 8 ½ inch waist (stretches larger), 7 ½ inch inseam, 16 ½ inches from waist to ankle. 12 MONTHS: 20-24 lbs, 9" waist (stretches larger), 8" inseam, 17" from waist to ankle. 24 MONTHS: 27-29 lbs, 10" waist (stretches larger), 10" inseam, 19" from waist to ankle. Belts are cute on kids but TOTALLY impractical! Buckles are hard, uncomfortable and hurt their little tummies! The look of the belt without all the pain and hassle! Snaps in the legs, Elastic waist. Soft fabric belt and buckle. If you have any questions about this product by 4Rodeo, contact us by completing and submitting the form below. If you are looking for a specif part number, please include it with your message.